Are you bogged down in compliance work, struggling to turn jobs around quickly enough and would like to do more value-add work but you just don’t have time? Well your situation is not unusual but there are companies who are changing things to their advantage. Before I go into the “how to save time to do more value-add” I’d like to delve into the why. Think about this: it is well known clients often come from referrals. But not all new clients are new to the market – many will have used another accounting firm. So why did they move to you? For instance, if a client chose you on the promise of you providing consulting services to them, then you have to deliver to ensure you keep them. The knock on effect of delivering what they want will be more referrals. I believe you can win in two ways here. Firstly, higher value work commands higher fees and it is difficult for a client to compare providers at this level and shop around on price. However, it is relatively easy for a client to compare the cost of a company tax return completed by two different firms. Thus if you are stuck doing just compliance work there is constant pressure to deliver at a low price. But the second way you can win is if a client is happy with your consulting work, they will be less resistant to paying the top rate for your compliance services. There is no doubt that providing services other than compliance can be more interesting for you. Doing the same thing year in year out would really be a struggle for anyone. But the same is true for your staff. Most staff want a challenge, to learn more, progress in their knowledge and in the company they work for. The reason most good accountants leave is because they cannot achieve the growth they require. If you want to retain the best accountants you need a growth mechanism built in to your firm. If you want to recruit the best accountants you want to be able to boast about the progressive career path and dangle the “you could be doing this soon” carrot. What you need is more time. Your biggest time wasters are most probably staff related. Helping staff, dealing with under-performing staff, checking and re-doing work (blowing out job budgets), team meetings, one-one-one meetings, training sessions, trying to recruit staff, reviews, inductions etc. Now imagine you have a team who for the most part are managed by someone else, trained by someone else, recruited by someone else and 90% of the work is reviewed by someone else……. do you think you would have more time for value-add work? Would your senior accountants have more time to learn and do more value-add work? Well this is what BOSS can do for you. You can off-load the compliance work and super fund preparation work. What you are left with is time to spend with your clients doing more value-add work. It’s simple. 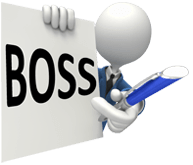 You decide what BOSS accountants you need working for you, we recruit them and then they do the work remotely as if they were your own staff using YOUR procedures. We can work directly on your system or you can upload work to our secure server. It takes just two hours to set up but gives years of additional time to do whatever it is you’ve never had time to do..